A rally was held in front of the Missouri Supreme Court in Jefferson City today after justices heard cases over minimum wage hikes. 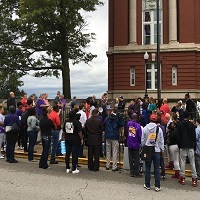 The group Missouri Jobs with Justice staged the gathering the same day the high court heard challenges to previous decisions striking down minimum wage efforts in St. Louis and Kansas City. About 100 people attended the rally. The court’s considering a challenge to a ruling which voided a minimum wage hike in St. Louis. It’s also looking at whether a minimum pay measure should have been removed from the ballot in Kansas City. The Missouri legislature passed two laws prohibiting municipalities from raising the local minimum wage above the state’s benchmark. A 1998 statute was ruled unconstitutional by a circuit court in 2001. It hasn’t been further litigated until now. Lawmakers passed another measure in 2015, which did not preempt local wage ordinances already in place on August 28th of that year. The governor vetoed the bill, but the legislature overrode the veto, and the measure became law. On August 28th, 2915, the city of St. Louis implemented a minimum wage law with an emergency clause to become law immediately. A group led by Cooperative Home Care Inc. then successful challenged the law in a circuit court, under the claim it violated the state constitution. The Supreme Court is now considering the city’s appeal. In Kansas City, the city council approved a minimum wage ballot initiative for the November 2015 election, but included language to remove the proposed ordinance if the legislature overrode the governor’s veto of the law barring cities from enacting their own ordinances. After the override, a circuit court granted the city authority to remove the proposed wage hike ordinance from the ballot, stating both the 1998 and 2015 laws passed by the legislature render the proposed ordinance unconstitutional. The Supreme Courts is reviewing an appeal by the backers of the Kansas City ordinance.